Hello Fellow Crafters!!! 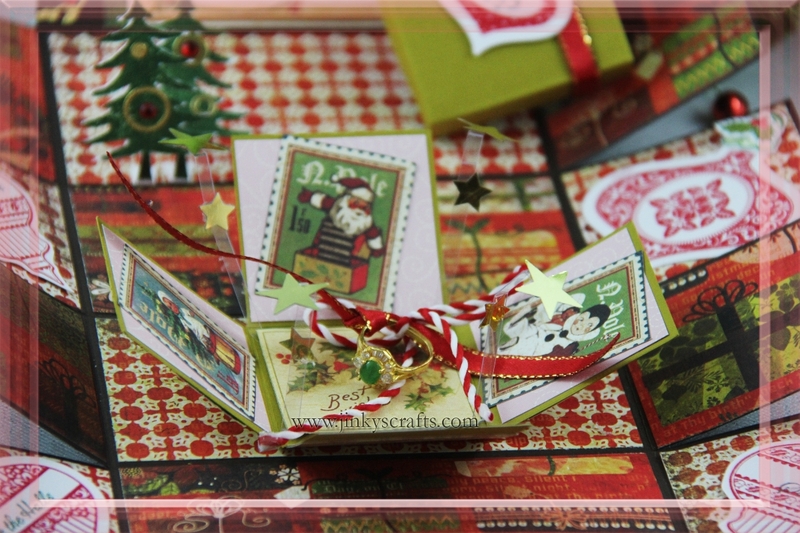 I am excited to show you the Day 3 preview project from my 12 Days of Christmas Handmade Crafts E-Book 3rd Edition. I really enjoyed designing and creating this Christmas Explosion Box In A Box. It is very easy to make, it just took me a little more time thinking how I will embellished it. But the outcome is so fabulous, hope you will agree with me on this,LOL! This creative gift packaging is very special. It will surely make those little gifts or treats extra ordinary! It can be used as packaging for jewelry , chocolate treats, or or bake goods. This creative holiday gift box is very easy to make and ideal for any level of Crafter. There's no need to bring out those die cut or electronic machine to make them. Like previous years, the complete instructions + dimensions + the step-by-step photo tutorial of this Christmas Explosion Box In A Box will be available in the 12 Days of Christmas Crafts E-Book -3rd Edition. Thanks for stopping by today. Hope this project inspires you. Please leave me a comment, Pin it, Share it! Let's all get creative! Wow, what a great project. Love that idea. Thanks for sharing.